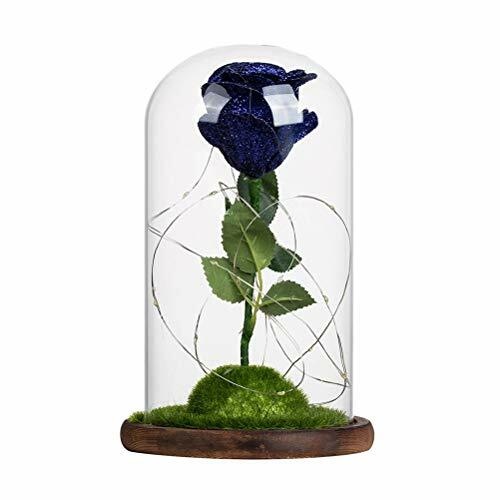 This Rose artificial flower made of High Borosilicate Glass and dried flower, which looks so beautiful and charming. Romantic meaning to send this gift, keeping your love fresh and last forever. These petals look almost real; they were soft and seem more charming. - Made of high-quality High Borosilicate Glass , look very real. LED strip light makes it more charming at night. It can show a beautiful and elegant look while it can also be preserved lifetime. - As a symbol of love, not only ideal for gifts to loved ones, friend or a teacher, but also would look amazing as a centerpiece in your living room or bedroom. - Just turn on the switch, these small bulbs will light up with bright warm white lighting. - It's wonderful and unique for cosplay, engagement, proposal, wedding gift, wedding cake topper, wedding decoration, Anniversary, Wedding Accessory and so on. - It is an amazing design,The classic begins with the classic, but not by the classic, let you enjoy the atmosphere.